A card shows that you care! In this age of texting and social media, giving a card with a message seems to have been pushed to the back seat. Not for me. I have fun finding cards destined for someone on my list. Graphic, witty, poignant, funny! If I ever learn Photoshop, then look out! 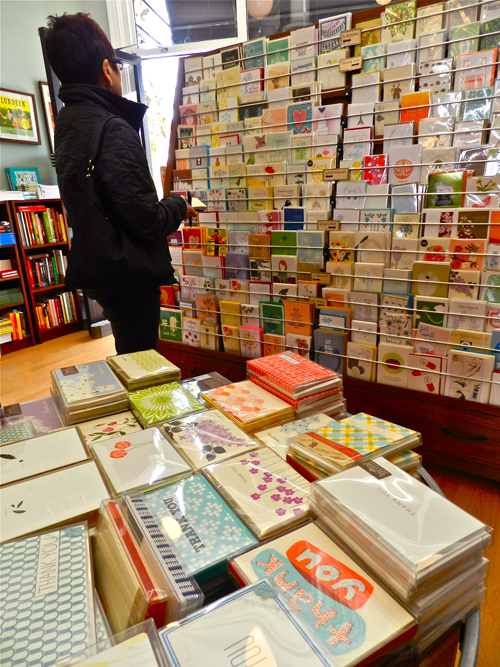 Find quality specialty cards at the Paper Source, Papyrus, Vroman’s Bookstore and museum shops. Target and Trader Joe’s are good back-ups. Colette Paperie popped up on my email. Cards with cool fonts, snappy phrases like “Your baby is FREAKING cute,” made me look, except they’re in Minneapolis. Clicked a link and found this gift shop in Culver City, Lundeen’s. Eclectic picks from the gift and card shows in LA and NYC make for many a happy shopper. A thumbs up to insightful owner, Kathryn Lundeen. Cards with character! Sayings will tickle your fancy, crack you up, or make you think twice. See where “i want to have text with you” in lower case Times font goes. Eye candy pops! To jump-start an interest in plants, check out the grow-your-own kits for veggies, herbs, mushrooms, even edamame. Snag a recycle bag to tote some animal bookends, Tokyo Milk cosmetics, soy candles, Pantone mugs or that ninja salt and pepper shaker. 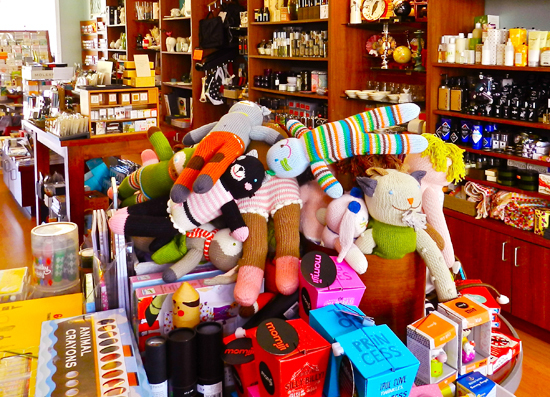 A kid’s nook is defined by knitted dolls and cuddly animals, books galore and artsy stuff for creative minds. For the mommy-to-be, add Aden and Anais muslin swaddlers, an Eric Carle book, wild socks that look like shoes and Vulli’s Sofie the giraffe teether. Buy a gift, it’s all wrapped up! Free. On the other end of town, out in the OC is the So-Phis 54th annual fashion show luncheon and boutique on Saturday at the Anaheim Hilton. This popular fundraising event directed donations to the Japan earthquake and tsunami relief funds. Boutique doors open at 9:30 a.m. for early bird shoppers. Asian-inspired fashions, bling and gift ideas from local artisans and show designers will tempt. Shopping is free but only a paid ticket lets you chow. 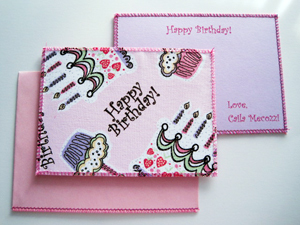 Pelham’s Paperie is all about fabric cards designed by Lissa Malone. Armed with a serger, an overlock sewing machine, she adds decorative touches to each card that’s backed with paper. This also prevents any edges from fraying. 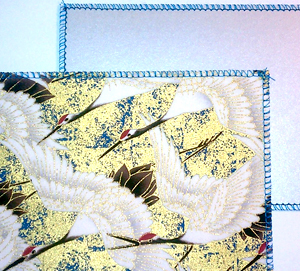 Here in the U.S., we admire the handmade papers and paper folding techniques used in Japan for cards and wrapping everyday products. This was the catalyst for Malone, who spent the first 16 years of her life growing up in Tokyo. Like a magnet, Malone is drawn to the unique, funky, cute, beautiful. Admitting that she is fabric-crazed, her senses hit inspiration overdrive whenever she is in a fabric store. So much so that she jokes that her home could be the fabric store. With a background in education as a Montessori teacher, what started out as a hobby is now a full-time business. “I like that I have the ability to relate to people of every age range. This is evidenced by the variety of patterns and designs in my stationery line,” she said. Malone credits her parents for who she has become—a gal with a positive attitude, social graces and a smile on her face. Make my day . . . get personal and send a card! Saturday, April 21, 9:30 a.m.-4 p.m.
Sunday, April 29, 9:30 a.m.-4 p.m.
Sunday, May 6, 10 a.m.-3 p.m.